The Iditarod National Historic Trail runs along more than 1,049 miles of the roughest, most beautiful terrain Mother Nature has to offer. “The Last Great Race on Earth”® pits man and animal against nature, and against wild Alaska at her best. It exemplifies the stamina and drive these canine athletes must have, and demonstrates the Nutrition in Action™ that Eagle Pack delivers. As the Official Dog Food Sponsor, Eagle Pack will also supply the teams with food along the trail, and dedicate funds to the health and care of the Iditarod dogs. 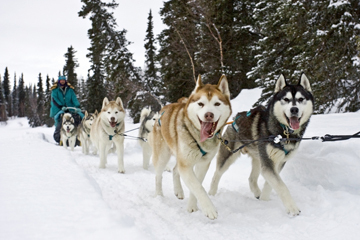 The Iditarod Trail Sled Dog Race runs from Anchorage to Nome, Alaska over approximately 10 days. More than 45 teams with 12 to 16 dogs each take to the icy snow each year to compete. The Iditarod is regarded as a symbolic link to the early history of the state, when mushers and sled dog teams were the only means by which to carry mail and supplies, including medicine, to the inland communities. This trail is connected to many traditions commemorating the legacy of dog mushing. Eagle Pack has long sponsored five Iditarod mushers and their teams: Martin Buser, Hans Gatt, Dee Dee Jonrowe, Aliy Zurkle and Karen Ramsted. For these mushers, the Iditarod is not just a dog sled race, but rather a venue in which unique men and woman from all walks of life compete to meet personal goals. From fishermen and miners to lawyers, doctors and artists, men and women from all over the world travel to Alaska to take part in this journey. The health and well-being of all the animals is a top priority as they travel the snowy course for more two weeks. 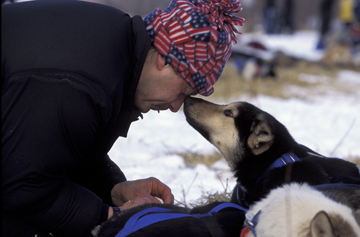 Dr. Al Townshend, Eagle Pack’s staff veterinarian and former recipient of the Iditarod’s Golden Stethoscope Award for ultimate canine care-giving, joins the mushers on the trail to help keep all the dogs in top shape. “Eagle Pack’s high quality, performance-proven formula has been developed with canine athletes and quality breeders. This has helped us make better foods for all dogs, not just those that require exceptional nutrition, and resulted in our gaining an advanced understanding of a dog’s true needs,” he says. To learn more about these canine athletes, and the care and preparation involved, sign up to become an Iditarod Insider™. With your membership, you can follow the leader board and see real time locations of mushers via GPS to read how fast teams are traveling and how much distance is between teams, and view checkpoints along with current temperatures on the trail. Insiders will also be able to access on demand video of the race so you’ll never miss a moment of the action! Click on Iditarod Insider to sign up and receive a bonus $10 Eagle Pack coupon when you join. Iditarod® , The Last Great Race on Earth® and Iditarod Insider™ are registered trademarks of Iditarod Trail Committee, Inc. This entry was posted on Wednesday, November 10th, 2010 at 5:20 pm	and is filed under Uncategorized. You can follow any responses to this entry through the RSS 2.0 feed. Both comments and pings are currently closed. That is great to see that the people of the Iditarod Race feel that Eagle Pack is the perfect food to feed there harding working dogs. It says alot about the quality of Eagle Pack. Good luck to all the sled teams in the race.